GOOD MORNING my creative friends & welcome to our 1st day of our "Twelve Days of Christmas"! Okie dokie, there are TONS of pics here for you to see today! I am NOT HAPPY w/my pictures because it was already to dark to use the light outside:( I promise, my "Countdown to Christmas" is MUCH PRETTIER in person! ;) I have been SO INSPIRED by all of these advent calendars lately that I just HAD to make one of my own! WOW, where do I start.....basically, all I did was adhere 25 of my cute little pocket dies to a kraft color 12x12 cardstock! I decorated every pocket using SEVERAL of my products & I just LOVE how it came out! For this title, I finally used my Cameo & cut out this free file (the banner)! I'm not sure exactly what size it is, I just made it big enough to fit across the entire 12x12 cutting mat! Then I was SO HAPPY to use my "Lower Case Fun Dies" for my title! I added some glass glitter to my snowflakes! Here are some pictures of all the pockets! This is one of the goodies that are tucked in a few of the pockets! I thought it would be a good idea to put a message that states "Read" & when the boys pick this, I will let them either go to Barnes & Noble OR let them order a book online! I thought this was PERFECT because BOTH of my boys LOVE to read! I used the cloud die for this message! This next one, I used one of the banners from my "Build a Banner Kit" & stamped a little chocolate kiss here! I'm not going to lie & say that this was SUPER EASY......lol...it took me 2 days to complete it, but I am in love w/the end result! I landed up "recycling" this frame that Miss Liz, Miss Katie & myself made either last year OR earlier this year! I had this frame in my craftroom w/a few of my favorite cards on it! I just removed the cards & used it for this~! I thought this frame was a PERFECT fit for this! (Pretend you don't see the hot glue on the right side of the frame) hahahaha! I forgot to remove it before my picture taking! Oh well, I hope you like it my sweet friends! Here is my video on how I put this together! Click on each of their names to see more pics & let them some bloggy love! I love the Advent Calendar, what an adorable stamp and die set! I also saw quite a few other projects that I could easily make. I really liked the gift box for votive candles. Your boys are going to love your count down to Christmas. So many great ideas and inspiration. I need to get busy. Can't wait for day 2. 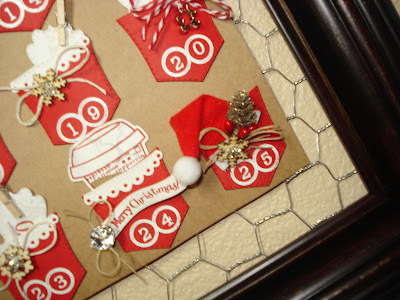 What a great count down to Christmas project-I remember when you made the original frame! Wonderful Advent Calendar! I love the Read card! What a great idea. Read you each day this was a great design Just loved it. WOWEEEE KAZOWEE lots of work but it looks great. I just got a Cameo too. Love it. Emma, you OUTDID yourself with this countdown calendar! Every little pocket is just perfect. Your family will treasure it always!!! HI I love your count down to christmas idea. Advent calendars bring back so many happy Christmas memories, just love this; what an absolutely adorable way to use the pocket die! Have recently discovered MCT and was just last night looking at those pocket dies trying to decide about ordering and after seeing this project - now I know! Wow! What a calendar!!!! It is so beautiful and fun for everyone. It is inspiring me to create one! I really like this and it looked like a lot of work. Nice job! Beautiful! I LOVE how you displayed this in the frame! Your countdown to Christmas hanging is awesome and oh what fun your boys are going to have....you did an awesome job on it. In the end all the time spent was well worth it. It's Here! It's Here! The frist of the twelve days of xmas...I've been waiting ALL year for this once again! Love your calendar! Time to hop! Just a fabulous idea. Your boys will have so much fun with this and will remember this for years to come. Just love the idea. Love the chicken wire frame. You are soo creative. Emma - an absolutely amazing calendar - one your boys will TOTALLY enjoy. I sure would, especially the 'read,' coffee, and chocolate selections. I see plenty of X and Os coming your way. One word = awesome! Thank you for sharing and inspiring. What a gorgeous Advent Calendar. Lots of work and it shows. Thanks for sharing and for the great giveaways. Wow, your calendar is so awesome! Thanks for sharing. ADORABLE Emma! Wish I had started something like this a little sooner! Maybe next year I can do it! Awesome! Just love it! You did an outstanding job. TFS this with all of us. As always a true masterpiece! Well worth the time! Have a wonderful day and thank you for the fun! This turned out so well--love it and thanks for sharing some of the ideas in the pockets! Wow....so amazing and what a fun way to count down to Christmas...love it! a very creative advent calendar. WOW Emma! This project is incredible!!! I just love all of your products...they are so versatile and all work so well together! I can't wait to see what else you have in store for us. love love love!! 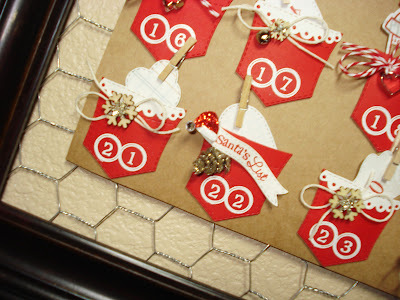 What a great idea, i have been looking for an advent callender to make and this is perfect!! One request though is please make the pocket dies seperate from the stamps!! PLEASE!!! can't wait to see what the DT has made! 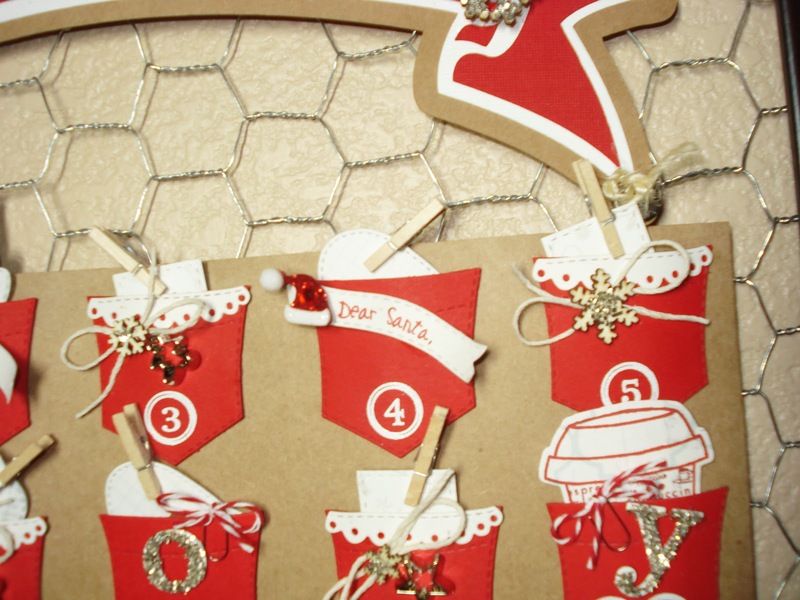 I love love love your advent calendar - I wanna go on a starbucks run - venti hot chocolate, 7 pumps of chocolate, no whipped cream! It's the only way to go! Thanks for the inspiration! Incredible as always!! I need to clear my schedule for the next 12 days Emma. Whenever your "12 Days of Christmas" comes each year my children and I get busy making EVERYTHING!! We have given away some pretty amazing gift baskets to teachers each year who rave and rave about their goodies!! (I can't take any credit though, as I scraplift, LOL) My kids still talk about the Shrinky Dink Santa earrings and bracelets we made for family members who were so touched by these hand made gems!! You are amazing, and as always, an inspiration!! Cheers to you and your so very talented team! Gonna get busy making this super adorable advent calendar. My daughter and I love it. We will make it together and put things in each pocket for the ENTIRE family. Each day someone different in the family will get something special so that way we can all be part of making it together. So fun! What an awesome calendar!! I just love how everything coordinates perfectly! WOW!! Emma your project is AWESOME!!! I LOVE all the fun elements you added to all your FAB stamps and Dies! What a GREAT 1st day of Christmas projects! Super awesome project! I love all of the details you added and the way you used the fun pockets! Thanks for the inspiration, I will be working on some holiday creations today! I love love love those red pockets with the white trim. And you know I and in love with the red coffee cups. Super super good job. I love this. I am so going to make one! Hi Emma, I look forward to see all your 12 projects for christmas and let me tell you that today's project is amazing, I love it, thanks for sharing. What a fun way to countdown to Christmas! I absolutely love your advent calendar especially how it showcases all your fun products (just in time to add them to my wish list). Can't wait to see tomorrows post! What a wonderful project! I can't wait to see the rest. Thanks for a chance to win! What a beautiful project, I love the advent calender, one of the cutest I've ever seen. Emma thank you so much for sharing your lovely talent. Love it. What a fabulous idea!! I love it! I look forward to seeing all your amazing projects! Thanks for sharing! Emma, I really love your advent calendar, I believe it is my favorite out of all the ones I have seen! Great job. Can't wait to see all your creative works to come. 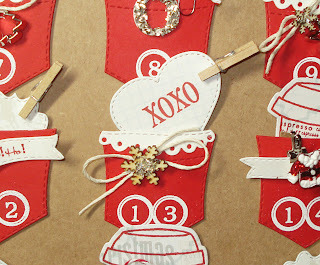 Emma, LOVE how you used your 'pocket' die for the Advent calendar....just perfect and it turned out so cute. Also love how Katie incorporated the Christmas tree on the side of her card. Really cute project, I now longer do a countdown as my children are grown and don't come until Christmas. Thanks for the opportunity to win your fav giveaway. Oh my goodness--I LOVE this idea!!!! I really want to make an advent calendar for my kids but can't decide what kind to make. This one is tops on my list now!!! Thanks for the inspiration!!!!!! Love your calendar! So great for kids! thanks for a chance to win. Great job on the calendar! Very clever. Thanks for a chance to win your 12 favorites. Your advent is awesome Emma!!! What a great idea. Your boys are goons love it! So excited to see your 12 days of Christmas, and the goodies that will be under my tree this year! My Creative Time goodies on my wish list! Oh my . . . that advent calendar is absolutely amazing. You sounded a bit stressed and worn out from making it, but let me tell you . . . WELL WORTH THE EFFORT!! Beautiful work. I am definitely going to be giving some thought to making one at some point down the road. So festive. Love your advent calendar. What a great idea. You did a great job! Excited for the 12 days of Christmas. Can't wait to what fun things you and the design team have come up with. Emma, your advent calendar is beautiful. I love that it is handmade and so different. It might have taken a while to make it and alot of effort to put everything together, but just think, you can use it every year. :) Love all the Design Teams projects. Great inspiration for handmade gifts and cards. I love all of your projects...you really are an inspiration. BTW, I just my order in last week and finally got to play with my dies/stamps. I LOVE THEM! Emma, I love this! So nice. First of all...I love it when you use that music for the 12 Days of Christmas!!! So cheery!!! And your advent calendar is AMAZING!!! What a lot of work, but it was sooooo worth it!!! It's FABULOUS!! Your boys will LOVE it!! And I think you win a prize for using the MOST MCT products in one project!!! AWESOME!! Great first day!! This is such a GREAT idea!!! I'll have to start working on one for next year. I love this idea! My "baby" is 12 but he still enjoys an Advent calendar. Thanks for the great ideas! Very cute idea! I love how you have different things that your kids will get each day. 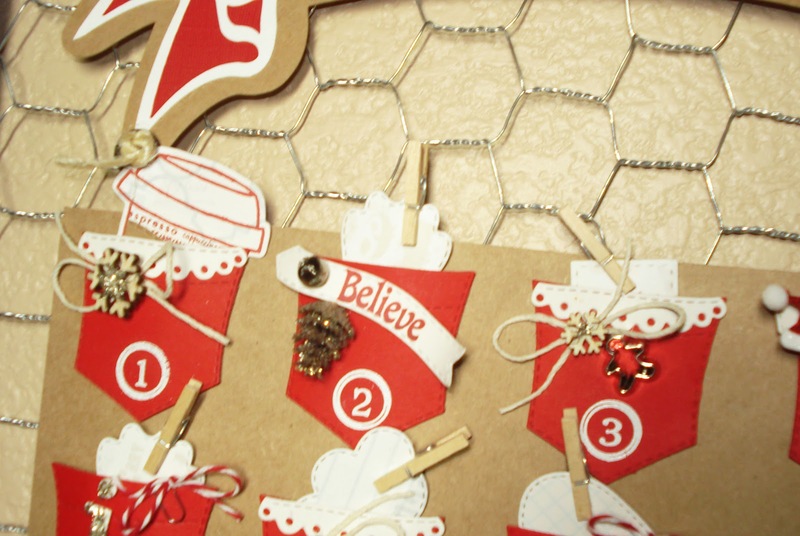 (I might just have to steal this Advent calendar idea from you and make my own!) I am also excited to participate in the 12 days of Christmas. I am excited to see what all you have planned! All the projects are adorable and so much fun. Well, this is simply BEAUTIFUL! You have outdone yourself! I have been slowly been doing my Christmas cards and I now must purchase the pocket die set to incorporate into a card or do a calendar for next year! I just love your stamps and dies! You inspire me to think outside the box! Much love, my friend! So cute, and what great ideas for advent gifts.... LOVE the Starbucks cup... and the pocket die is so cute! Great idea, love the colors. Frames are really the in thing right now. Can hardly wait until the next one. Your advent calendar is awesome Emma! Every detail is amazing - you do such excellent work. Love the cards made by your team too! This is awesome!! I love it!! That calendar is AMAZING!!!! What a wonderful Advent calendar! You did such a great job! 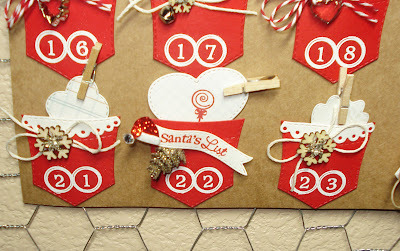 Love the first day of this project.. can't wait to see the next day..
very cute way to do an advent calendar. tfs. The Advent Calendar was amazing. I thought you had cut each circle and stamped it...Embossing was perfect. Love your calendar and all of the Design Teams projects! Awesome calendar! I always am anxious to see what ideas you come up with. And, you are right, your design team is great! What a great idea, Love it and all the DT projects. Great advent wreath!! And thanks so much for the chance to win a super duper prize!! Emma, this is so STINKIN' CUTE! I can't think of a more perfect use for all your products. Your favorite may be day 13, but, I'm certain you're really looking forward to day 14! Thanks for the opportunity to win another AMAZING giveaway! What a super cute idea!! Thanks for sharing with us, and thank you for the chance at a very awesome giveaway!! Just love the pocket countdown. Love the chicken wire behind it also, very cute. Thanks for the inspiration. Great project for counting down to the big day! Awesome project! I love the idea of giving the boys something different every day. Thanks for sharing. Love the calendar and the anticipation that comes along with it for the kids everyday. What a wonderful and fun holiday calendar! You did a great job on it! I'm really looking forward to seeing what you and your DT have made for this 12-day event. TFS and thanks for the chance to win such a fun prize! I love your project. It was so creative to use the pockets this way. I can't wait to scraplift this idea. LOL! Gorgeous advent calendar! You can tell how much work you put into it. Thanks for sharing! What a beautiful Advent Calendar. I just love all your projects. Can't wait to see all 12 days. I LOVE Advent calendars. This one is so cute! what a great advent calendar I love everything you and your design team make.I cant wait to see whats next. What an awesome advent calendar and so pretty too!! My kids would love that!! I love your advent calendar. I love all the projects. Your count down to Christmas is adorable. your calendar is so pretty! OOOOOoooh how I love these. I think I will try to make something similar its so great. I know it took long, so thanks for creating it and sharing it with us. Love it. Emma, your calendar is amazing and very creative! Beautiful project, thank you for sharing! Wow...what a lot of work but it turned out beautifully! A.M.A.Z.I.N.G!!!!!! This would look absolutely PERFECT in my house!!!! I need this!!! LOVE LOVE LOVE this Emma!!! Thanks for sharing all the cute ideas and pockets! That's a very cute advent calendar! My daughter always loved opening the little boxes each day, your kids are going to love this! So very cute & easy to make! Btw - my contact info is jp.divajewel@gmail.com. I love the advent calendar what an awesome Idea. I want to make one for my husband, he is such a kid!! lol thanks again for sharing. Great Calendar Emma! You have put so much work into it. Your children will love it. TFS! Soooo super kute n kreative...I love you're fun n kreative ideaz!!! Great Day 1 of the 12 days of Christmas creations!! Each time I look at a post with all the great thins you ladies make it makes me want to go do some creating myself!! Amazing calendar something that can be used for years to come! I can't wait to start creating some Christmas cards tonight! Hi Emma, great idea. I never make a project for the count down to christmas. I like this home decor. Thanks for the opportunity. i have always loved these calendars. I really love how made yours. Absolutely beautiful. This advent calendar is the cutest I have ever seen! Also loved the my 'stache jar. I really love all of your stuff. Thanks for the chance to win. Oh Emma! Brilliant!!! I love this advent calendar. You know...I have to be honest. I am only recently learning about Advent Calendars through the crafy blogs, but they are wonderful. You did a fantastic job, my friend. Wow~ The end result was so worth your time! Will have to try this with my own spin. Thank for the inspiration. OMG how stinking cute is that! All the projects are adorable! You are so clever to create such a wonderful project. I know your boys will definitely love them! Absolutely love this advent calendar! I love your advent calendar. I think I may try one out for my granddaughters, but will have to do it for next year. Thanks for all the hard work you did on it. What a beautiful project, I love your version, so clever! That's really a cute advent calendar! Thanks for sharing how you made it. I also love the candle box card. Emma ~ Emma ~ Emma ~ First let me say I LOVE and ADORE your project! OOOMMMGGG!!! The details to EVERY single pocket is just AMAZING! I am in awe this only ( note this would have taken me a week at the least) 2 days to make! WOW, WOW and WOW!!! I do recommend you locking this up because if I could get my hands on it ~ it would be in my house for sure!! Well you TOTALLY kcikced off your 12 days with a STUNNER!! The DT's just blew my mind today too! I think they ALL did a FABULOUS job! This is such a fun idea and so honored this is my first time getting to play along with the 12 Days on MCT!!! Thank YOu!! I am sure your boys will love your Advent calendar! I just love your countdown to Christmas Emma. Super super cute! Love your Countdown to Christmas - what a great idea! Nice advent calendar and all the projects look like a lot of fun. OMG This is truly a keeper! Wow, amazing and done with such detail!! I love Reds and whites and again...your products are wonderful on their own but even better if they are joined together!! What a fun advent calendar!! Love the DT projects also! What fun! I love all the Chistmas ideas. My head is spinning with ideas. Emma that Advent calendar is adorable and VERy creative. Your design team has come up with some amazing and crafty ideas and projects. Off to see the rest! This is gorgeous! Your projects are such an inspiration!! 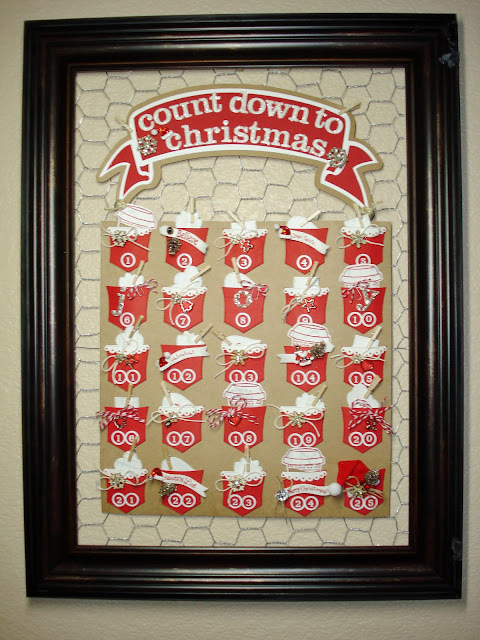 This is an awesome Christmas countdown home decor project. OMG so much detail and perfect for Christmas. 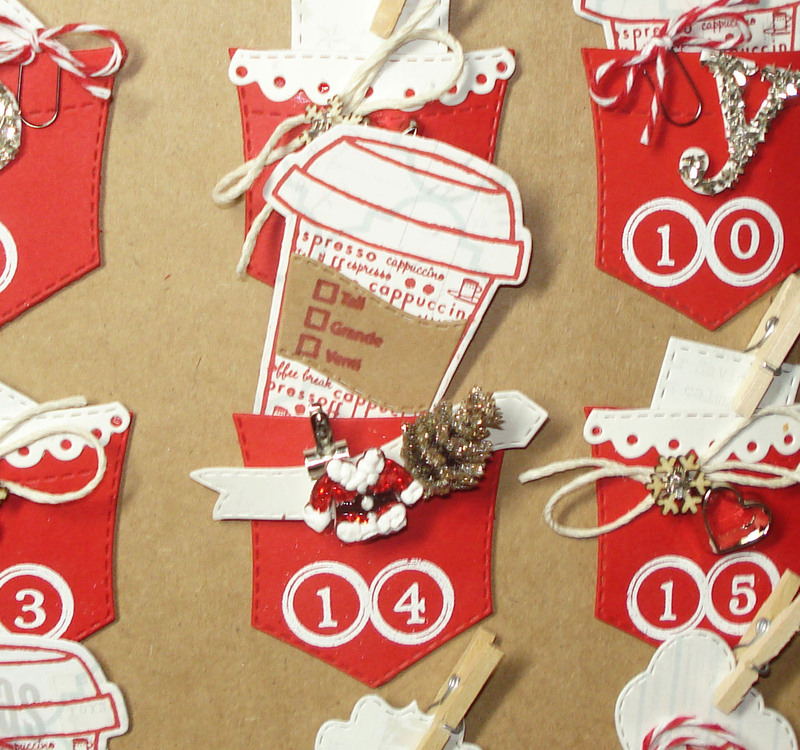 I love the advent calendar and cup of coffee, they are beautiful! So glad I stumbled onto your blog!! This Advent Calendar is so cute. I am amazed with your talent and all your inspiration. Everyone did an awesome job. Fabulous projects! Can't wait to try some of these! 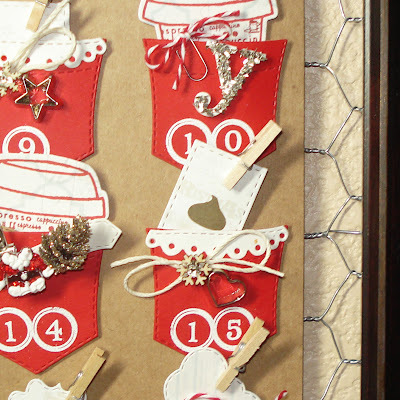 What a super cute and fun way to count down the days to Christmas! Gr8t job Emma, your so creative and your DT too! Wow these are too adroable! Great job to everyone. A great way to display the advent calendar. So much talent!!! Thanks for the chance to win 12 amazing products. Wow how cute! Love the calendar we do countdown to Christmas but this is adorable. This is absolutley amazing. I am not sure I would have the time to make it until Winter Break, but I LOVE it! I enjoy how you teach step by step. I simply love your advent calendar, it is just beautiful. Thanks for sharing it. Love your cute calendar. TFS. Lots of work and love went into this one. 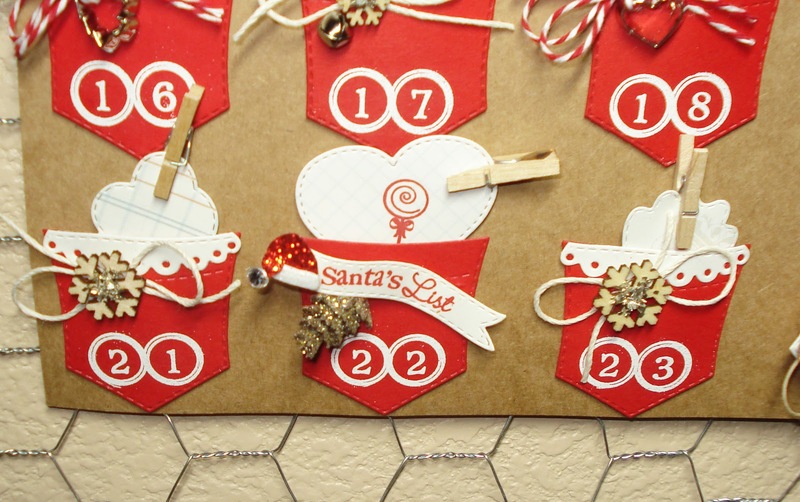 What a great way to make an advent calendar! Great ideas and loved your advent with all the details! Love how you did this! Can see you put alot of thought and love into it! I've never seen a Christmas calendar that pretty. I'm sure your boys are going to love it. LOVING that advent/count down calendar! What an awesome awesome idea!